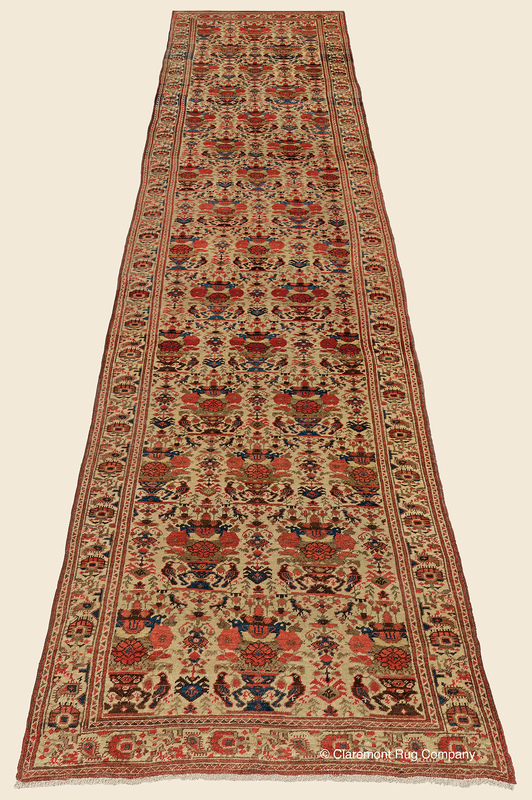 Search Our Inventory / All Rugs / 3&apos; 4" x 15&apos; 8"
3&apos; 4" x 15&apos; 8"
(High-Decorative) (�Spring 2019 New Acquisition�) This is a particularly exciting find, as virtually all antique runners employ geometric patterns. In this surprising, highly successful departure, exceptional fluency of incredibly intricate yet effusive botanical forms create a captivating world of color and design. Its precise, pinpoint all-over pattern of ornamental bouquets is both spacious and expansive, coupled with a luminous parchment ground tone and an astounding abundance of vivid, potent jewel hues, with lapis lazuli, garnet, celadon and ruby making every motif even more inviting to the eye. This over a century-old runner�s nearly 16 ft length and fabulous condition make it destined to transform an important hallway.